The seven color mountain is a majestic location located in the Cusco region. Vinicunca is a majestic location and nature’s gift. Its name takes from Quechua and means ‘seven color mountain.’ You will find it on your way to Ausangate, in the region of Cusco. After a five hour hike up the mountain, we arrive to the town of Machuraccay, where we will climb the foothills of Vinicunca. 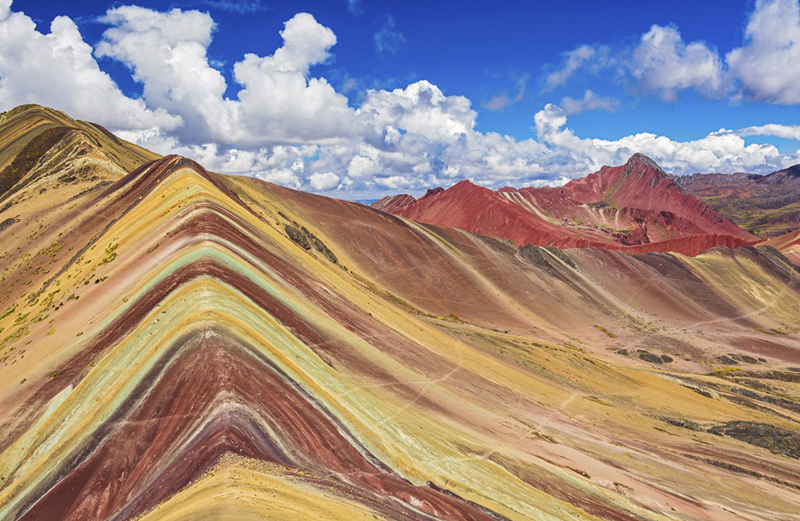 Vinicunca is one of the most spectacular places in the Cordillera Vilcanota, as it keeps a natural color that is given by the presence of sedimentary rocks that are eroding. What’s impressive is how the stones have been formed to create a set of seven colors, also known as Cerro Colorado. The rainbow mountain was ranked by National Geographic as one of the 100 places you must visit before you die, due to the beautiful colors. Cloudy days result in darker colors, whereas sunny weather will lend to lighter colors. Don’t miss the opportunity to be part of this wonderful place. You’ll be rewarded unforgettable memories such as sumptuous high mountain panoramas, peaceful pastoral scenes, and the herds and breeders of camelid such as the lama and alpaca. This article was written by Arturo Alva, marketing specialist for InkaNatura Travel, the only leading Tour Operator owned by a nonprofit conservation group, PERU VERDE. Specializing in fine archaeology and natural history tours for discerning travelers, nature lovers, adventurers and explorers.